This OECD iLibrary Theme subscription provides one copy of each new print publication and online access to all books and online databases OECD publishes on social issues, migration, and health. 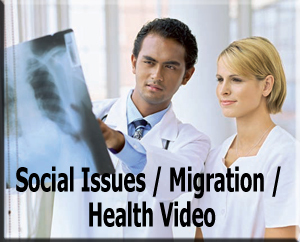 It includes access to the OECD International Migration Statistics, OECD Social Expenditure Statistics, and OECD Health Data databases as well as to about 20 new books each year on related topics, including such titles as Society at a Glance and Health at a Glance. The subscription includes access to titles published from 1998 onwards and all historical data available in the statistical databases. OECD's annual publication analysing the latest developments in migration stocks and flows, immigrants in the labour market and migration policies. Country reports provide detailed policy information for each OECD country and special reports look at current issues. This subscription provides annual data on migration and stocks of foreign population, workers, and asylum seekers into and out of OECD countries broken down by source country. Data are generally available from 1991 onwards. This subscription includes access to the International Migration Outlook annual. Formerly titled the OECD Social Expenditure Database (SOCX), this database includes reliable and internationally comparable statistics on public, mandatory and voluntary private social expenditure at program level, covering old age, survivors and incapacity-related benefits: health, family and active labor market programmes; and unemployment, housing and other social policy areas. Access to the Society at a Glance publication is included in the package. OECD Health Statistics offers the most comprehensive source of comparable statistics on health and health systems across OECD countries and selected non-member countries. It provides data on the health status of the population, health care financing, health care resources, social protection, health care utilisation, the pharmaceutical market, long-term care resources and utilisation, non-medical determinants of health, expenditure on health and demographic and economic references, with coverage being provided as far back as 1960. Access to the Health at a Glance publication is included in the package.